When it comes to online Poker machines, Native American culture is a popular theme and Chief’s Fortune from Microgaming carries on that tradition, with a backdrop of an Indian encampment and the Chief himself rewarding players with some extra treats when he lands in the right spots. It’s a basic 3-reel game, with a single payline and a fun bonus round that makes it a bit more than just spinning the reels and collecting any wins that happen to come your way. A sense of fun runs through this game, particularly in the bonus which is in the cartoon style that Microgaming use across so many of their pokies, so let’s have a look at how it works and see if players will get their bankrolls scalped or not. First appearances suggest this is going to be a very basic pokie, as the overall design isn’t exactly stunning and not an Apache on more up to date video games. There’s a nice background image to complement the reels, and the Chief’s Fortune logo is prominent below them, but as for the 3 reels themselves, they will tend to be covered with the standard symbols, like bars and 7’s. Players will also see a very limited bet range with coin values being fixed at 1.00, giving themnothing to do other than decide if they want to bet 1, 2 or 3 coins on a spin. The paytable lists what they will win for each combination and for the most part wagering 3 coins will win exactly 3x the amount that wagering 1 coin will win. So the ratio is the same, but having a bet range that goes from 1.00 to 3.00 is really limiting and will put off a large proportion of potential customers. Moving on to the symbols though, and from the bottom of the pile we see the Any Bar symbol which is worth a single coin, (assuming a 1-coin bet), when the payline gets bars across it, while moving up a spot we see the single bar that pays out 5 coins. Then it’s on to double and triple bars that will reward players with 20 or 40 coins for a full line, while the red 7’s, decorated with feathers to keep up the theme has a value of 80 coins at a single coin bet, which equals 240 coins at the maximum wager. It’s all very standard so far, but starts to get quite interesting from now on, with the Chief’s Fortune logo being worth a substantial 200 to 600 coins depending on the bet size, and the Chief himself carrying a prize of 500 for 1 coin, 1000 for 2 coins, but bet 3 coins and that jumps to 2000 coins. The Chief is also a wild symbol, so he will act as any other to complete a winning line, although unlike many similar games, he doesn’t multiply the base win value when this happens. What we do have however, is a fun bonus game, although it will only be triggered if the maximum 3 coins are being used. During normal play, arrow symbols can appear on the payline and when they do, they are added to the image of a target set below the reels. Once 5 arrows have been collected, it’s off to a second screen where players need to get the chief dressed for a party in the Chief’s Dilemma game. To get him dressed, players just need to click the spin button and the game will choose footwear, trousers, shirts and headgear for him, which can be quite entertaining if he winds up in fluffy bunny slippers and a Scottish kilt for example. The more of the correct items of clothing he gets, the bigger any payout will be once the round ends, but it’s totally random, with no real input from the player other than to click the buttons. Is It a Powwow, or Are There Reservations? 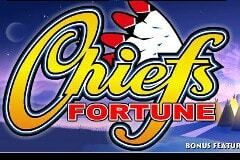 Chief’s Fortune is a classic game with a twist. In normal play there’s nothing to get too excited about, as the symbols are in the main the same ones that are featured on a zillion other 3-reel pokies, but anyone wagering 3 coins will soon enough trigger the bonus game, and it’s quite a treat. It’s a shame that it won’t begin for those staking just 1 or 2 coins, and I don’t see why the payout couldn’t have been reduced proportionally, but Microgaming seem to want to encourage bigger wagers. Having said that, 3.00 is hardly a fortune and tops off one of the smallest bet ranges going.